When Noah was born, we realised quite quickly we were going to need a baby carrier. Firstly because Noah absolutely loves resting on our (mainly mine, shh!) chests, I think because he can hear our heartbeat & feel our warmth, it settles him quickly and he often falls asleep. Another reason was due to the hassle sometimes it can be to get his car seat in and out of my car, especially when people have parked terribly in bay's next to us and getting a car seat out can be tricky. Getting just Noah out & popping him in a carrier was looking much easier. 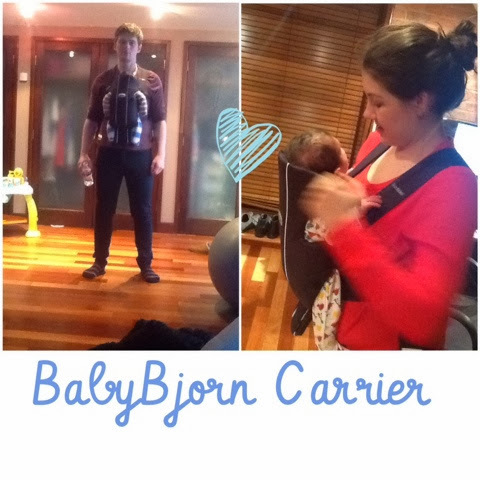 We did a little bit of research into which was the best carrier, but as I wanted one that would be super easy for me to put on when alone, I knew we'd have to go and test them. We headed to John Lewis and due to some terrible customer service we were left to ourselves to try some on. After failing with a couple we picked up the BabyBjorn Classic Carrier, I'd seen reviews but it looked pretty complex at first. I was wrong. Now we aren't the most DIY couple, but it's honestly so easy to get on. The BabyBjorn Carrier consists of straps, which you pop over your shoulders like you would a coat, the carrier part then has three parts on each side. Each clip attaches to a clip on the straps. There is a clip at the bottom, middle and top of each side. You just clip up on side, pop you're little one in and whilst holding them use your other hand to clip up the other side. It truly is, extremely easy. There is lots of padding up top for your newborns head & neck, there is also adjustable straps either side so can ensure maximum comfort & security for them. I really liked the fact that there is instructions on the inside of the carrier, so you can be putting it on as you're following them. The carrier grows with your child as it's all adjustable, and once you're little one reaches the age where they can support their own head, you can change it so they're in a forward facing position, which will be perfect for Noah as he's super nosey. I can't complain about this product at all, Noah completely loves it and often falls asleep when in it, I'd definitely reccommend it.